240v to 12v constant voltage led power supplies. Fully complient with the NZ electrical regs. Great for powering led strip lights, cabinet lights and anything that uses a 12v power supply. 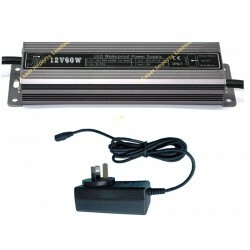 12v 30W Led power supplyThis can power 5 of our waterproof led strip lights connected together. ..
You are buying 1x 12V DC desktop power supply. Great for use with our 3528 type strip light..
You are buying 1x 12V DC power supply. Great for use with our 5050 type strip lights in..
12v 60W Led power supply constant voltageThis can power 10 of our waterproof led strip lights co..